Seems the long-overdue Georgie Fame revival is happening. I’d no sooner finished reading a four-page interview with him in Mojo than I turned to your latest post, Richard. Any indication as to when the R4 programme might be scheduled for, please? And Mr Fame – if you’re reading this – any chance of playing anywhere in the Midlands any decade soon?! Sorry – I missed the italic bit at the bottom saying it will be broadcast in December. Look forward to it greatly. Really pleased with the resurgence of interest in Georgie. Always one of my favourite artists. Seen him live a couple of times……last time on the Radio Caroline 50th anniversary cruise last year. Memories of drug busts at the Flamingo and the floor after a carpet of Dexedrine. Georgie has always had great taste (well, except for the Pye years) – about 10/15 years ago R2 gave him his own one hour slots to play his formative influences; great radio, great music, shouts of “Clark Terry” to intro Yeah Yeah. Looking forward to the upcoming broadcasts. Surely Georgie must have a book in him? HI nice review and great to see the club being remembererd , but I would like to correct an error you say ” Johnny Gunnell, who, with his late brother Rik, owned the Flamingo ” They did not at any time own the Flamingo, it was owned by my late father Jeffey S Kruger. Who founded the club and owned it till it closed. The Gunnell brothers ran the all nighters on Friday and Saturday nights. Sometime between The Higsons & The Scapegoats I played with Uttoxeter combo Yeah Jazz. 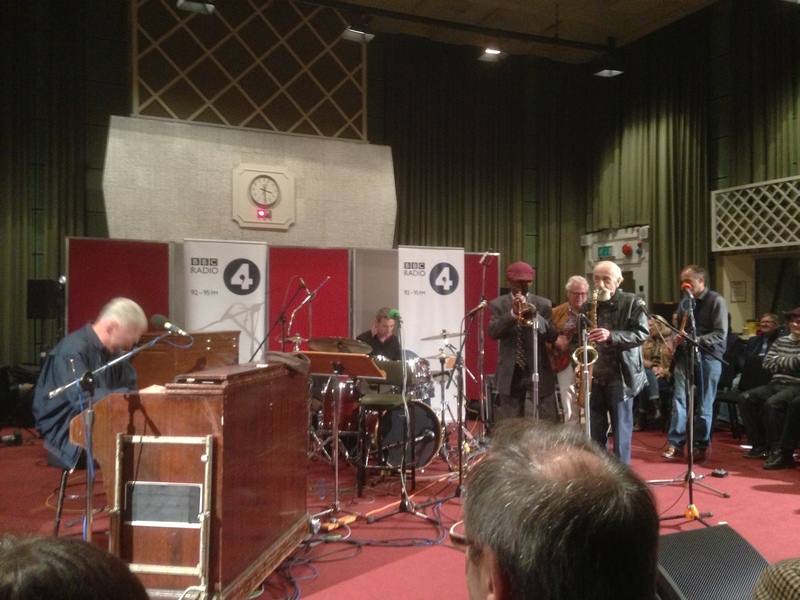 We recorded a couple of radio sessions at Maida Vale and for one we booked the BBC’s Hammond organ. On the day we had to wait for it to become available as a certain Mr Fame was using it in an adjoining studio. When I played it it was still warm! I was so pleased to be asked to comment from the audience about my memories from 1964. Georgie seemed touched by the heartfelt respect we have for him. He is still an inspirational figure for me and what a privilege to be in that room yesterday. Terry Tonik. Ubiquitous session guitarist Big Jim Sullivan was credited on the album. The record was engineered from the cramped band room beside the stage by Glyn Johns. You say there was a sense of dismay when Yeh Yeh took him mainstream, but look at it another way: a host of 12 year olds like me dug deeper and discovered Jazz. Of course, Eric! I was just expressing the view of a snobby mod. Which I was. Or am. I have been looking forward to the reissue of all those great 60s Columbia recordings by Georgie Fame for years and placed an order for the new box set as soon as I heard about it; I know how great this music is and I cannot believe that ‘Uncut’ magazine has seen fit to give ‘The Whole World’s Shaking’ set only a 6 out of 10 rating; some mistake, surely – perhaps they chose the wrong reviewer, Richard. The forthcoming Radio 4 ‘Mastertapes’ broadcasts are an unexpected Christmas bonus – can’t wait. I remember a night at the Flamingo as a teenager, when, with some friends, we had queued for some time for the Stones last London cub gig at the Club Noreik in Tottenham. Giving it up as a bad job we wound up all night at the Flamingo where we ended up in an extended chat with Andrew Loog Oldham and Lionel Bart. The band was “Bluesology” which would at that time have included Reg Dwight and possibly Elton Dean. “Am I growing old?” (Quote, not question – obviously unnecessary! ).